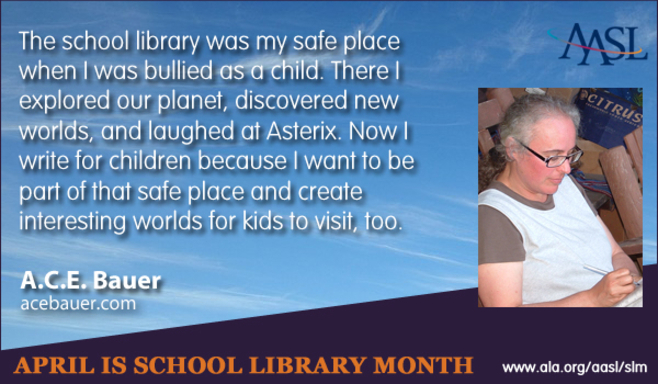 April is School Library Month, when, every year, the American Association of School Librarians' (AASL) celebrates school librarians and their programs. This year's theme is Lives change @ your library®, and as part of this celebration, I was honored to be asked to contribute to their Gallery of Authors. I'm featured in their Tip of the Day calendar (April 29), along with a host of very talented authors.You can sign up for all their tips, or follow them on Facebook or Twitter. Thank you to all the school librarians who do so much for kids everywhere. And thank you to the AASL for asking me to participate.